Photograph, Darrell K. Royal-Texas Memorial Stadium in Austin, Texas, 2006. Image courtesy of the Wall Street Journal. Image available on the Internet and included in accordance with Title 17 U.S.C. Section 107. Photograph, the University of Texas Marching Band forming a "T" at the dedication game for Texas Memorial Stadium against Texas A&M, 1924. Image courtesy of the Jordan Photo Company and The Portal to Texas History. Image available on the Internet and included in accordance with Title 17 U.S.C. Section 107. DARRELL K. ROYAL–TEXAS MEMORIAL STADIUM. Darrell K. Royal–Texas Memorial Stadium, formerly Texas Memorial Stadium, has been the home of University of Texas football and track teams since 1924. In that year Henry Jacob Lutcher Stark, chairman of the UT Board of Regents, and L. Theo Bellmontqv, athletic director, led a fundraising drive to erect Texas Memorial Stadium on the eastern edge of campus. An estimated 10,000 students, alumni, and friends of the university gave money to build the 27,000-seat facility, which was designed by architect Herbert M. Greene of Dallas. The cost of excavation (by the List and Gifford Company of Dallas), construction (by Walsh and Burney of San Antonio), and other work came to $275,000. The west stands of Texas Memorial Stadium were not yet complete when the Texas Longhorn football team hosted Baylor University on November 8, 1924. The visiting Bears won the game, 28–10. But the stadium was dedicated nineteen days later, when UT played archrival Texas A&M in front of 33,000 fans, then the largest crowd to witness an athletic event in state history. Before the game—won by Texas, 7–0—a sometimes somber although mostly joyous ceremony was held, dedicating the stadium to Texans who had served in World War I. The growing popularity of college football in Texas and around the country was the prime reason for building the stadium. But it was designed as a dual-purpose facility with a 440-yard cinder track surrounding the football field. Longhorn track coach Clyde Littlefield inaugurated the Texas Relays on March 27, 1925, drawing to Austin some of the best college track athletes and even three Olympians. The stadium proved as well-suited for track as for football. In 1926 Texas Memorial Stadium was enlarged, as a 13,500-seat "horseshoe" was built on the north end for $125,000. Designed by A. T. Granger, the main entrance bore a striking resemblance to the facade of the Alamo; bronze plaques to deceased Texas soldiers were mounted at the entrance. 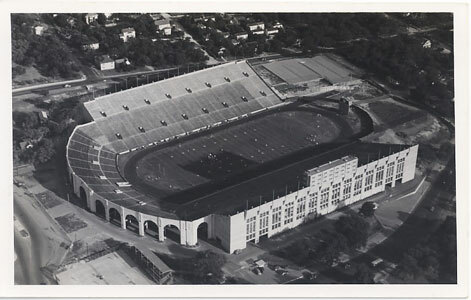 Postcard photograph, Texas Memorial Stadium with seating expansion on the north end forming a "horseshoe" and the added L-shaped sections on the east and west stands, ca. 1950. Image available on the Internet and included in accordance with Title 17 U.S.C. Section 107. During the Great Depression interest in Texas football and track declined, and some people wondered why such a big stadium had been built. However, new football coach and athletic director Dana X. Bible was responsible for a renaissance of sports at UT. "Pappy" Lee O'Danielqv's 1939 gubernatorial inauguration was held there in front of 45,000 people. By the mid-1940s attendance at Longhorn home football games had grown so much that Texas Memorial Stadium once again had to be enlarged. In 1948 architect George L. Dahl designed two L-shaped sections to be added to the stadium's east and west stands, raising seating capacity to 60,130. The cost of this project was $1.4 million. Texas Memorial Stadium was rededicated on September 18, 1948 (at halftime of the Texas-Louisiana State football game), to honor Texans who had died in World War II. Photograph, the instillation of the Texas Memorial Stadium floodlights made it possible to hold night events, 1956. Image courtesy of Neal Douglass Photography and The Portal to Texas History. Image available on the Internet and included in accordance with Title 17 U.S.C. Section 107. Photograph, the construction of the west-side upper deck at Texas Memorial Stadium looking north, 1970. Image courtesy of Neal Douglass Photography and The Portal to Texas History. Image available on the Internet and included in accordance with Title 17 U.S.C. Section 107. Photograph, Darrell K. Royal-Texas Memorial Stadium new turf installation, 2009. At the south end of the stadium (top center) is the stadium's Jumbotron. Located east of the stadium (left of picture) is the Mike A. Myers Stadium and Soccer Field. Image courtesy of the Austin American-Statesman. Image available on the Internet and included in accordance with Title 17 U.S.C. Section 107. After years of debate, lights were added to the stadium in 1955, allowing football games and track meets to be held at night. The success of the Longhorn football program under Darrell Royal, including the university's first national championship in 1963, led to more frequent sellouts and questions about whether Texas Memorial Stadium was obsolete. In 1965 William W. Heath, chairman of the board of regents, began exploring the possibility of moving all intercollegiate athletics off campus and razing the stadium. But opposition was strong, and the stadium received a much needed facelift in 1967. Two years later work began on a west-side upper deck that would raise seating capacity to 75,504 when completed in 1972. The fan-shaped deck sat atop Bellmont Hall, a modern academic-athletic complex. Artificial turf, a rubber track, and aluminum seats were installed at the same time. Some students, alumni, and administrators protested the expenditure of more than $20 million to enlarge and refurbish the stadium. In the summer of 1977 the Texas Memorial Stadium track was converted from 440 yards to 400 meters. At a football game that fall the building was dedicated for the third time, to include American veterans of all wars. The Vernon F. "Doc" Neuhaus–Darrell K. Royal Athletic Center was completed at the south end of the stadium in 1986 at a cost of $7 million. It housed locker rooms, coaches' offices, lecture rooms, and weight-training room and a seventy-yard practice field. A new four-color animated scoreboard was unveiled in 1989. In 1996 the university again honored its legendary football coach by renaming the stadium the Darrell K. Royal–Texas Memorial Stadium. At the same time it launched a three-year renovation project. In the first year the stadium's artificial turf was removed and replaced by a sophisticated grass playing field, a Jumbotron video system was installed, the scoreboards were retrofitted, and the Frank Denius Practice Fields were completed. In 1997 fourteen stadium suites were added to the west side of the stadium and the underside of the stands was completely remodeled, adding a new concession plaza and a visitors' locker room. A 5,000-seat upper deck on the east side was completed in 1998, adding fifty-two new stadium suites and a 13,000-square-foot private club room. In 1999 the 20,000-seat Mike A. Myers Stadium and Soccer Field, located east of the football stadium, was completed. The track oval in the DKR–Memorial Stadium was removed, new seats were added to the west grandstand, and the field was lowered seven feet to accommodate new front-row and field-level seats on the east and west grandstands. At the completion of the renovation stadium capacity was 80,092. Including stadium workers, media, and others, actual attendance can go as high as 85,000, surpassed in the state only by Texas A&M's Kyle Field. Margaret Catherine Berry, The University of Texas: A Pictorial Account of Its First Century (Austin: University of Texas Press, 1980). Denne H. Freeman, Hook 'Em Horns: A Story of Texas Football (Huntsville, Alabama: Strode, 1974). Lou Maysel, Here Come the Texas Longhorns (2 vols., 1970, 1978). Richard Pennington, "For Texas I Will": The History of Memorial Stadium (Austin: Historical Publications, 1992). Carlton Stowers and Wilbur Evans, Champions: University of Texas Track and Field (Huntsville, Alabama: Strode, 1978). Kern Tips, Football, Texas Style (Garden City, New York: Doubleday, 1964). Handbook of Texas Online, Richard Pennington, "DARRELL K. ROYAL-TEXAS MEMORIAL STADIUM," accessed April 25, 2019, http://www.tshaonline.org/handbook/online/articles/xvd01.